Clip clop, clip clop go the horses’ hooves as you glide past the chocolate box cottages and manicured gardens on your way to the perfectly decorated village church where you’ll marry your soulmate. Country weddings are amazing for so many reasons, but how could you possibly find a wedding suite that matches the sophistication, elegance and delicacy of such an occasion? Luckily, you’ve stumbled upon the Monoglam wedding suite from The Invite Guy! 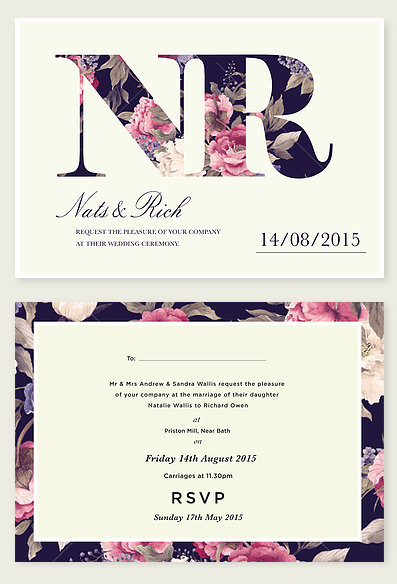 This stylish and suave design features a range of truly beautiful fonts, a traditional vintage-inspired background of classic flowers and a simple-but-effective no-nonsense layout. Elegant enough for a wedding to rival Kate & Wills, this design exudes a sense of passion, indulgence and exquisite detail, yet is highly customisable for that bespoke feeling. You can add a spark of Monogram sophistication to every aspect of your wedding, thanks to the wide variety of wedding stationery; we’re talking invitations, Save the Dates, folded place cards, table name/numbers, menus, Order of Service and table plans. The fun doesn’t stop there, though! If you’d like to include extras in your invitation such as maps, travel information, accommodation options, menus or even a section for song requests, just ask and we’ll help to adapt the invitations to include all of the details that are important to you. This little corker is available in single sided, double sided, folded once AND folded twice layouts, so pick your colours, carefully choose your words and don’t keep your guests waiting any longer! Tags: English Country Garden, Monogram.